No to Cuts and Privatisation! TUSC will oppose all cuts to council jobs, services, pay and conditions. Reject increases in council tax, rent and service charges to compensate for government cuts. Vote against the privatisation of council jobs and services. TUSC has had hundreds of declarations of support. 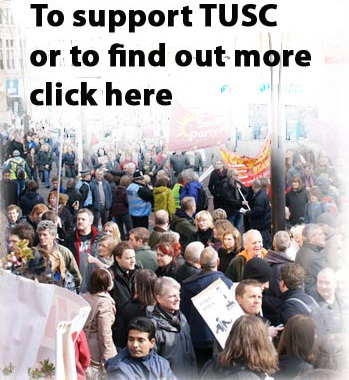 You can support TUSC as an individual trade unionist or socialist, or apply for your organisation to join TUSC. TUSC has no big business sponsorship. TUSC is a coalition for the millions not millionaires. Every donation to TUSC strengthens our fight for a better future. The Trade Unionist and Socialist Coalition (TUSC) has 78 candidates standing in Thursday's local council elections, contesting seats across 24 local authorities in England, Scotland and Wales. The general election, called after the local elections were already under way, has obviously cut across the council contests. Driving the Tories out on June 8th and the election of a Corbyn-led Labour government will clearly create the best conditions to defend local public services. But every TUSC vote on Thursday will be an early declaration of support for Jeremy Corbyn's anti-austerity policies - policies that are being attacked relentlessly not just by the Tories but by Labour's right-wing Blairites too. And as the former Labour MP and TUSC national chairperson Dave Nellist said when the general election was called, the TUSC local election campaigns "will also lay the groundwork for building the support Jeremy will need against the capitalist establishment, including the Blairites within the Labour Party, if he does win in June" (see http://www.tusc.org.uk/17358/22-04-2017/tusc-chair-dave-nellist-welcomes-general-election-chance-to-drive-out-the-tories). TUSC has been fielding candidates on a 100% anti-austerity socialist platform since its formation in 2010, co-founded by the late general secretary of the RMT transport workers' union, Bob Crow. Obviously the political situation has changed since then, with Jeremy Corbyn's election as Labour leader. TUSC has continued to contest local elections against right-wing Labour councillors carrying out Tory cuts but it has not stood candidates - including this Thursday - against Labour politicians who have resisted austerity in the council chambers. So vote TUSC where possible on Thursday - and then join the campaign to help finish May in June and get Jeremy Corbyn into No.10. All the TUSC results will be published on this website although we can't say exactly when. Many councils have cut back on overtime for election staff and are not beginning their counts until Friday morning. So not all results will be available until the weekend but we will be posting regular updates from Friday afternoon onwards.